← Does Stress Affect A Cat? 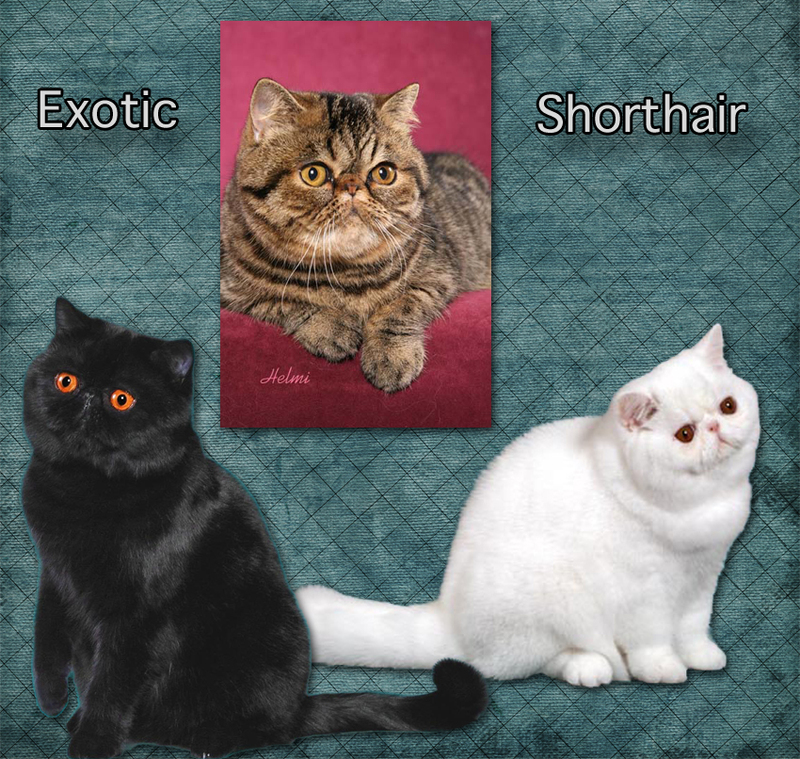 This is a page on the Exotic Shorthair written in plain English with a large picture. People are free to use the words but not the pictures. The Exotic Shorthair is a Persian cat with a short haired coat. It is a popular and well known cat breed but it is less well known than the Persian. The Exotic Shorthair’s coat is dense and “plush”. This means the coat feels thick and luxurious to touch. If you love the Persian cat but don’t really want to spend a lot of time combing and brushing the long fur of the Persian, then the Exotic Shorthair is the cat for you. However, you will still need to groom this cat. The Exotic Shorthair is called a “man made breed”. This means that cat breeders have created this cat by putting cats of certain breeds together to let them mate and produce a “hybrid” kitten. A “hybrid” cat is a mixture of more than one type or breed of cat. In this case, in 1960s America, breeders mated the American Shorthair, another very popular cat breed, with the Persian. The idea was to create American Shorthairs with long fur. The result was the Exotic, which has a short, solid body and a flat face. In the language of cat breeders these cat body shapes are called “cobby”. Breeders also mated British Shorthair, Burmese and Russian Blue cats with the Exotic Shorthair when doing more work on the breed later on. This is called “developing the breed”. Although there were some people who did not want the Exotic Shorthair accepted, the world’s most important cat association, the Cat Fanciers’ Association (CFA) accepted the new breed in 1967. It has gone from strength to strength from then on. Some cat associations treat these cats as Persians with short hair instead of as a different breed. However, the Exotic has the same health problems as the Persian such as “tear duct overflow”. This means that the very flat face prevents the moisture from the eyes draining through a tube at the corner of the eye because the tube (a “duct”) is not straight enough. Also sometimes the breeding produces a cat with jaws that are not lined up properly. The coat is not exactly like a shorthaired cat’s coat but nether is it long. The coat can be almost any color and pattern. The Exotic Shorthair is a medium sized cat weighing from 7-14 pounds or 3-6.5 kilograms. There is a dense undercoat. This is a double coated cat. The cat in the middle of the picture on this page is a brown tabby cat. The most noticeable feature is the squashed face. This is exactly like the Persian. The Exotic Shorthair has the same personality as the Persian, which is gentle and relaxed together with periods when they use up some energy in spells of activity. It also has the same small voice as the Persian. But please remember that each cat is an individual so you can’t say all cats behave in a way that we think a Persian or Exotic should behave. Because the Exotic was created by mating a Persian with an American Shorthair it is a bit more lively and nosy than the Persian. I have decided that this is a lap cat like the Persian. They are not very demanding. They are probably suited to full-time indoor living or apartment life. This entry was posted in Cat Breeding, Cat Breeds, Cat Coats, Cat Facts, Cat Facts For Kids, Cat Fancy, Cat photography, Exotic Shorthair, Pictures of Cats and tagged cat body shapes, cat facts, cat facts for kids, cat grooming, exotic shorthair cat, persian cats, pictures of cat breeds by Michael Broad. Bookmark the permalink.